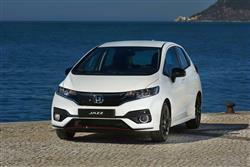 Find out everything you need to know on the new Honda Jazz from independent vehicle review website Car And Driving. You can watch the video review to the left to see more of the car or read their written review below to get a true insight from an expert in the automotive industry. Jazz buyers get two petrol engine options, a 1.3-litre i-VTEC petrol unit offering 102PS and a 1.5-litre i-VTEC variant with 130PS. Both are mated to a sweet-shifting six-speed gearbox and both have to be worked quite hard to give of their best. Still, if you push along, performance is reasonable and in the 1.3-litre model that most will choose, 62mph from rest can be covered in 11.2s en route to 118mph. Optional is a CVT automatic gearbox, which enables the 1.3-litre Jazz to return very reasonable efficiency figures - 61.4mpg on the combined cycle and 106g/km of CO2. We'd suggest this variant to be appropriate for urban-based buyers only though. Around the corners, this third generation model feels reasonably sharp thanks quite feelsome steering and an 'AHA' 'Active Handling Assist' system that helps get traction down through the bends. Over longer distances, you'll notice the decent refinement too. There's also some clever technology, like the 'Intelligent Speed Limier'. Working in conjunction with a 'Traffic Sign Recognition' system, this set-up knows what the prevailing speed limit is and limits your pace accordingly, so here's no chance of absent mindedly creeping past 30mph and getting zapped by a roadside camera. As before, Honda has priced this Jazz against higher quality offerings in the supermini segment, so expect to be payment Volkswagen Polo rather than Ford Fiesta money for one. Prices start at around £14,000 and there's an £1,100 premium to pay if you want the CVT automatic gearbox. The volume 1.3-litre 102PS i-VTEC petrol unit is on offer across a choice of three trim levels - 'S', 'SE' and 'EX'. If you want the 130PS 1.5 i-VTEC unt, you'll need the more dynamic 'Sport' variant. Specifications are generous across the range, with base-grade 'S' models fitted with convenience features such as air conditioning, cruise control with speed limiter and dusk sensing auto lights. Every grade comes with Honda's City-Brake Active to help avoid low-speed accidents. The mid-grade 'SE' model adds front and rear parking sensors, electrically adjustable and heated door mirrors and 15" alloy wheels. Honda's Driver Assistance Safety Pack is also included, giving owners the extra reassurance of five advanced active safety aids. Customers opting for the 'SE' or 'EX' models will also benefit from the Honda Connect in-car infotainment system as standard. This Android-based system features an app-based 'pinch, swipe and tap' interface accessed on a seven-inch touchscreen in the centre of the dash. Honda Connect comes with pre-installed apps, with others available for download from the Honda App Centre. These give rapid access to internet-based services such as web browsing, real-time traffic information, news and weather, social media, and internet music stations.